Heat the oven to 375ºF/190ºC. 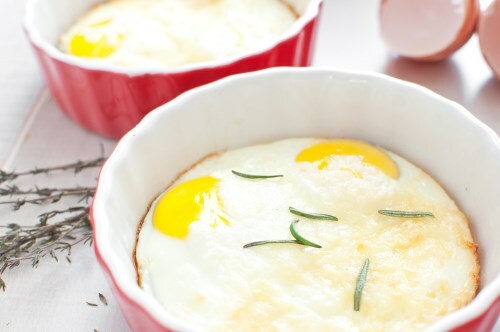 Gently crack an egg in on top & gently add 4 egg whites. Top with a spoonful of crème fraîche. Set the ramekins in a baking dish and pour hot water in the dish to come half-way up the sides of the ramekins. Bake until cooked, but still jiggling, 5 to 7 minutes.